The Sigma fit Sigma 10-20mm F3.5 EX DC HSM is a super wide-angle lens with maximum aperture of F3.5 throughout the entire zoom range. It has two ELD glass elements and one SLD glass element which provide excellent correction of colour aberrations. Four aspherical lenses provide correction for distortion and allow its compact and lightweight construction. It also features a hyper sonic motor which enables quiet and high speed auto focus. 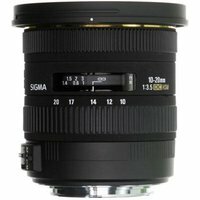 The Sigma 10-20mm F3.5 EX DC HSM lens is designed for digital SLR cameras with an APS-C sized sensor and vignetting will occur if used with digital SLR cameras with larger sensors or 35mm film SLR cameras.